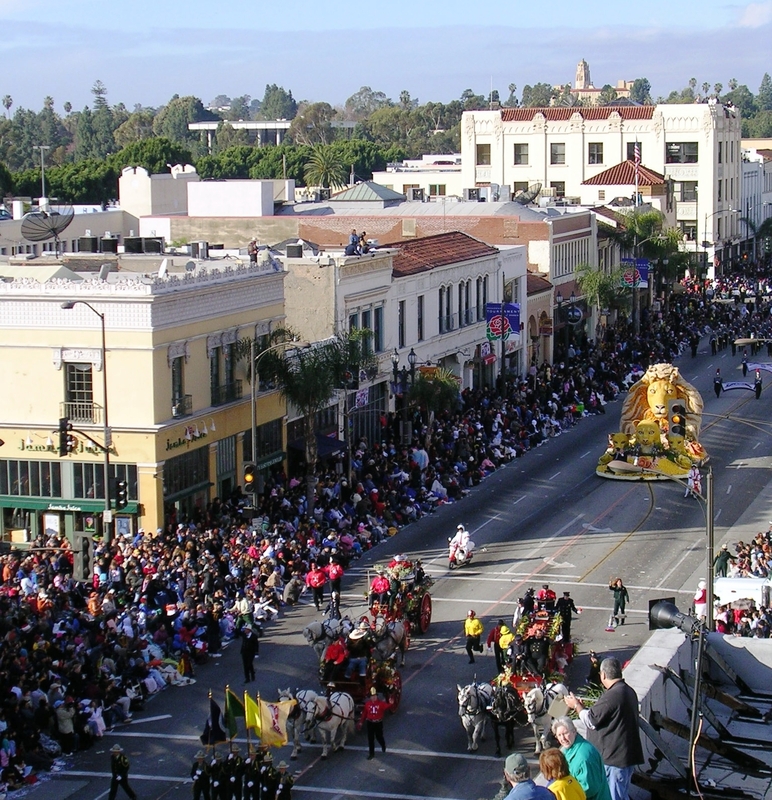 The Tournament of Roses parade passes through Old Pasadena. Pasadena hosted the first Tournament of Roses parade in 1890. The city of Pasadena (population 133,936), incorporated in 1886, is located in southern California between Los Angeles and the San Gabriel Mountains. Originally an agricultural settlement, the city grew when the Union Pacific Railroad lines were completed in the 1880s. A business district soon developed in what is now Old Pasadena, a National Register Historic District. In 1890, the city hosted the first Tournament of Roses parade. The Rose Bowl Stadium, a National Historic Landmark, was built in 1922 for the annual Rose Bowl football game. Now televised internationally, the parade and game attract thousands of visitors to Pasadena each year. At the turn of the 20th century and through the early 1930s, the city had several large resort hotels. During these years, Pasadena was a popular winter destination for wealthy industrialists and entrepreneurs, many of whom resettled in the area and built ornate mansions. During this era, many artists, architects, and writers were also drawn to Pasadena, and through them the city emerged as one of the leading centers of the Arts and Crafts movement in the United States. Many Arts and Crafts-style houses remain in the city today, including the Gamble House, a National Historic Landmark. Built in 1908, the house was designed by architects Charles and Henry Greene, and today is jointly owned by the City of Pasadena and the University of Southern California. In 2004, seven years of planning came to fruition as the house’s exterior was restored after years of deterioration and improper repairs. An 18-month long centennial celebration was held for the house in 2008 and 2009, which included tours, lectures, exhibits, and other special events. Architectural innovation continued in Pasadena beyond the Arts and Crafts movement. In the 1920s, the City Beautiful movement inspired the development of the city’s civic center, a National Register Historic District with a Mediterranean-style City Hall. Many buildings in Period Revival architectural styles were erected in Pasadena, which also has a sizeable collection of significant mid-century modern and ranch-style buildings. Today, the city has more than 3,500 properties with historic designations, which helps it attract many tourists each year.